in beige and green for a change. 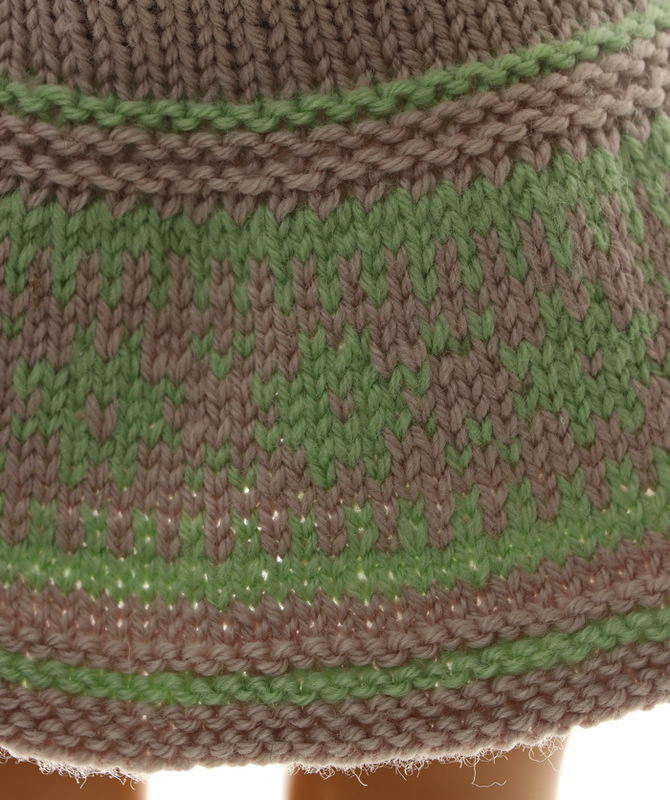 The dress has little wide edge knitted with a flower pattern in green. Cast on 160 sts in beige and knit 5 rows ga. Change to green and knit 2 rows ga. Change to beige and knit 2 rows ga. Continue knitting in the round and knit 2 rows st st before knitting pattern A. (See diagram) Continue knitting in beige and knit 1 row before knitting 4 rows ga. (k1row, p1 row, k1row, p1 row) = 2 ridges on the RS. Change to green and knit 1 row, purl 1 row = 1 green ridge on the RS. Change to beige and knit 1 row. On next row k2tog across row = 80 sts in total. 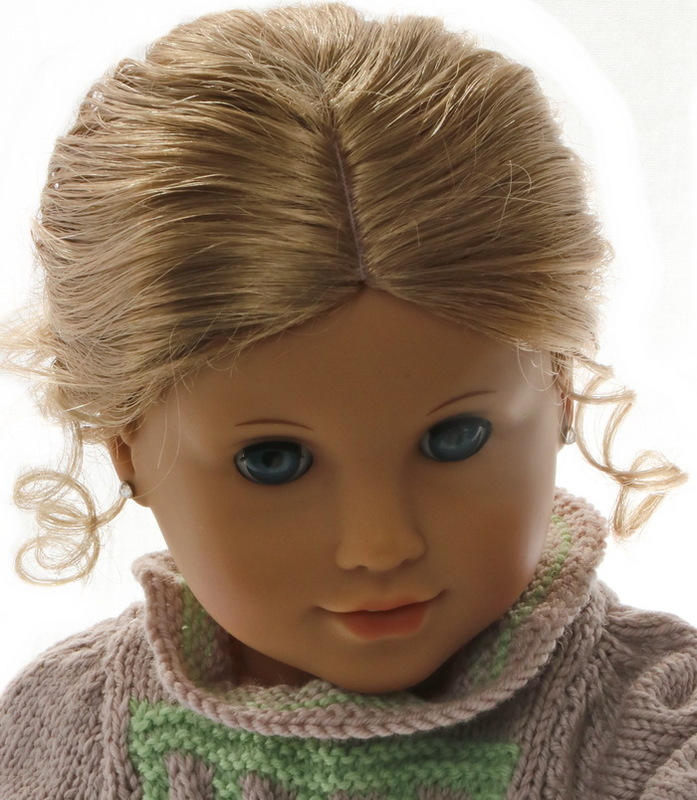 Continue knitting st st until work measures 14 cm for American Girl doll (12 cm for Baby born). On the next row decrease for the armholes like this. Begin at one side: Cast off 3 sts, k34, cast off 6 sts, k34, cast off 3 sts. On the front yoke, I have knitted a square pattern. 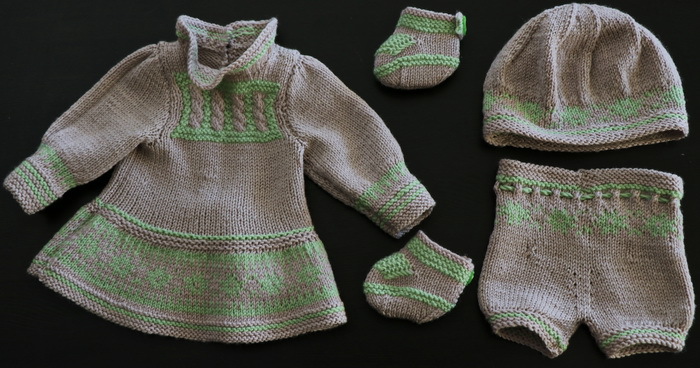 The pattern has 4 cables in beige and edges around the cables knitted in green garter sts. 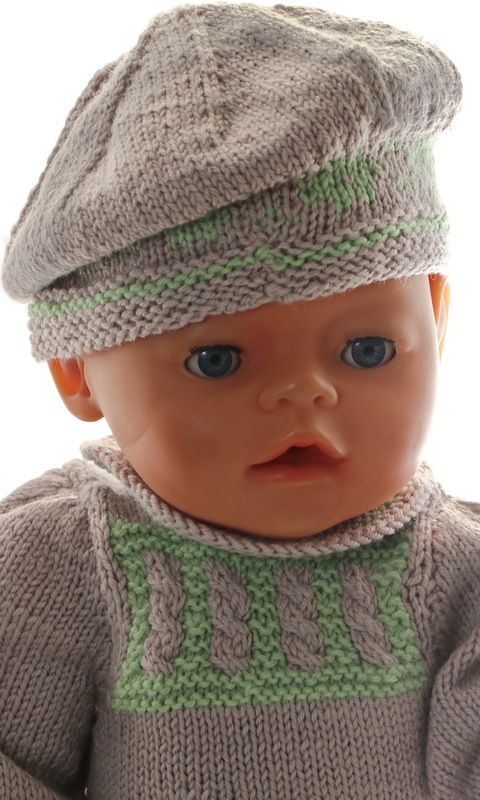 ... Continue knitting pattern B. (See diagram) inside 3 sts at each side knitted in beige st st. After completing the pattern continue knitting 2 rows st st before casting off for the neckline like this. Cast off the 12 center sts and knit each side separately. Decrease 1,1 sts every second row, Knit 3 rows st st and put shoulder sts on a cable ndl. The other side is knitted in the same way with decreases on the other side. Back Purl 1 row. Continue decreasing 1 sts at each side and knit 6. The sleeves have a border inn a little green pattern before knitting the rest of the sleeves in beige st st. The pants are also knitted in beige. The pants have a little flower pattern around the waist and a green chord around the waist. 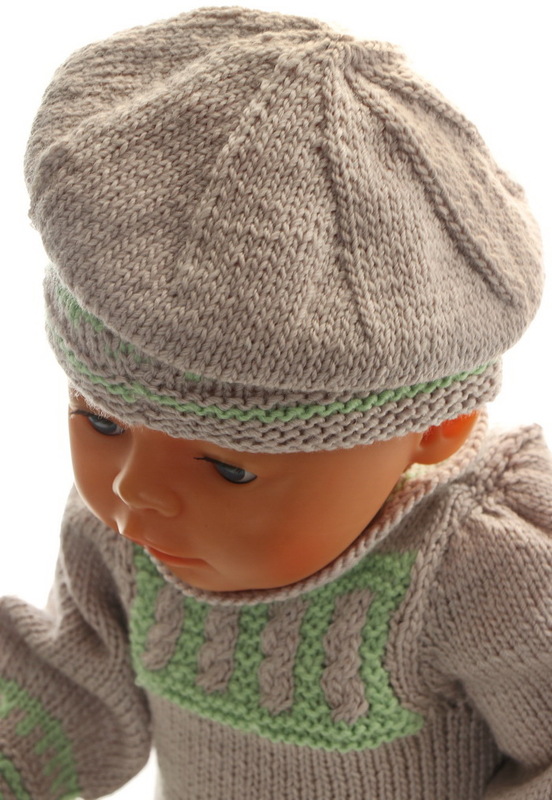 The neckband is knitted in beige. It is wide and has a green stripe along the neck. The dress is buttoned at the back with a green button. Kjolen er knappet bak med en grønn knapp. Cast on 80 sts in beige and knit 5 rows ga. Change to green and knit 2 rows ga. Change to beige and knit 2 rows st st before knitting a row of eyelets like this. K2tog, yon alternatively across row. Continue knitting 4 rows st st before knitting pattern C. (see diagram) Place a marker for center back and center front. Begin row from center back and. Knit 2 rows st st before knitting the pants back longer like this: K20, turn, purl 40 sts back, turn, k30, turn, purl 20 sts back. Continue knitting 2 rows ga before doing the following increases: K1, increase 1 sts in next sts, knit until 2 sts before center front, increase 1 sts in next sts, k2, increase 1 sts in next sts, knit until 2 sts before center back, increase 1 sts in next sts, k1. Repeat these increases every 3rd row 4 times altog = 96 sts on row. Continue knitting 2 rows st st over all sts before knitting the legs separately. ... I knitted a beautiful hat to complete the dress and it looked lovely. 1st row: K3, k2tog TBL, k10, k2tog TBL, k10, k2tog, k10, k2tog, k3. Finally, I knitted a pair of ankle shoes in beige and green. The ankle strap is buttoned with green flower buttons. ... as you see the design unfold.